Marie, 20, loves to spend the night in every club in town. She and her friends are always seen drinking alcohol every night in almost every bar. At the age of 41 and still with the same habit, Marie starts to feel severe abdominal pain every now and then. She was shocked to notice a bruising in her flank area one morning when she was in the shower. She always feel dizzy at work and sometimes feel nauseous. She consulted a physician and she was diagnosed with pancreatitis. Pancreatitis ranges from a mild, self-limited disorder to a severe, rapidly fatal disease that does not respond to any treatment. Pancreatitis is an inflammation of the pancreas and is a serious disorder. Pancreatitis can be a medical emergency associated with a high risk of life-threatening complications and mortality. Pancreatitis is commonly described as autodigestion of the pancreas. The most basic classification system divides the disorder into acute and chronic forms. Acute pancreatitis. Acute pancreatitis does not usually lead to chronic pancreatitis unless complications develop. Chronic pancreatitis. Chronic pancreatitis is an inflammatory disorder characterized by progressive destruction of the pancreas. Self-digestion of the pancreas caused by its own proteolytic enzymes, particularly trypsin, causes acute pancreatitis. Entrapment. Gallstones enter the common bile duct and lodge at the ampulla of Vater. Obstruction. The gallstones obstruct the flow of the pancreatic juice or causing a reflux of bile from the common bile duct into the pancreatic duct. Activation. The powerful enzymes within the pancreas are activated. Inactivity. Normally, these enzymes remain in an inactive form until the pancreatic secretions reach the lumen of the duodenum. Enzyme activities. Activation of enzymes can lead to vasodilation, increased vascular permeability, necrosis, erosion, and hemorrhage. Reflux. These enzymes enter the bile duct, where they are activated and together with bile, back up into the pancreatic duct, causing pancreatitis. Pancreatitis affects people of all ages, but the mortality rate associated with pancreatitis increases with advancing age. Approximately 185, 000 cases of pancreatitis occur in United States each year. 150, 000 of these cases are the result of cholelithiasis or sustained alcohol abuse. The overall mortality rate of patients with pancreatitis is 2% to 10%. Mechanisms causing pancreatitis are usually unknown but it is commonly associated with autodigestion of the pancreas. Alcohol abuse. Eighty percent of the patients with pancreatitis have biliary tract disease or a history of long term alcohol abuse. Bacterial or viral infection. Pancreatitis occasionally develops as a complication of mumps virus. Duodenitis. Spasm and edema of the ampulla of Vater can probably cause pancreatitis. Medications. The use of corticosteroids, thiazide diuretics, oral contraceptives, and other medications have been associated with increased incidences of pancreatitis. Severe abdominal pain. Abdominal pain is the major symptom of pancreatitis that causes the patient to seek medical care and this result from irritation and edema of the inflamed pancreas. Boardlike abdomen. A rigid or boardlike abdomen may develop and cause abdominal guarding. Ecchymosis. Ecchymosis or bruising in the flank or around the umbilicus may indicate severe pancreatitis. Nausea and vomiting. Both are also common in pancreatitis and the emesis is usually gastric in origin but may also be bile stained. Hypotension. Hypotension is typical and reflects hypovolemia and shock caused by the large amounts of protein-rich fluid into the tissues and peritoneal cavity. Fluid and electrolyte disturbances. These are common complications because of nausea, vomiting, movement of fluid from the vascular compartment to the peritoneal cavity, diaphoresis, fever, and use of gastric suction. Pancreatic necrosis. This is a major cause of morbidity and mortality in patients with pancreatitis because of resulting hemorrhage, septic shock, and multiple organ failure. Septic shock. Septic shock may occur with bacterial infection of the pancreas. The diagnosis of pancreatitis is based on a history of abdominal pain, the presence of known risk factors, physical examination findings, and diagnostic findings. Serum amylase and lipase levels. These are used in making diagnosis, although their elevation can be attributed to many causes, and serum lipase remain elevated for a longer period than amylase. WBC count. The WBC count is usually elevated. X-ray studies. X-ray studies of the abdomen and chest may be obtained to differentiate pancreatitis from other disorders that can cause similar symptoms. Ultrasound. Ultrasound is used to identify an increase in the diameter of the pancreas. Blood studies. Hemoglobin and hematocrit levels are used to monitor the patient for bleeding. CT scan: Shows an enlarged pancreas, pancreatic cysts and determines extent of edema and necrosis. Endoscopic retrograde cholangiopancreatography: Useful to diagnose fistulas, obstructive biliary disease, and pancreatic duct strictures/anomalies (procedure is contraindicated in acute phase). CT–guided needle aspiration: Done to determine whether infection is present. Abdominal x-rays: May demonstrate dilated loop of small bowel adjacent to pancreas or other intra-abdominal precipitator of pancreatitis, presence of free intraperitoneal air caused by perforation or abscess formation, pancreatic calcification. Upper GI series: Frequently exhibits evidence of pancreatic enlargement/inflammation. Serum amylase: Increased because of obstruction of normal outflow of pancreatic enzymes (normal level does not rule out disease). May be five or more times normal level in acute pancreatitis. Serum lipase: usually elevates along with amylase, but stays elevated longer. Serum bilirubin: Elevation is common (may be caused by alcoholic liver disease or compression of common bile duct). Alkaline phosphatase: Usually elevated if pancreatitis is accompanied by biliary disease. Serum albumin and protein: May be decreased (increased capillary permeability and transudation of fluid into extracellular space). Serum calcium: Hypocalcemia may appear 2–3 days after onset of illness (usually indicates fat necrosis and may accompany pancreatic necrosis). Potassium: Hypokalemia may occur because of gastric losses; hyperkalemia may develop secondary to tissue necrosis, acidosis, renal insufficiency. Triglycerides: Levels may exceed 1700 mg/dL and may be causative agent in acute pancreatitis. LDH/AST: May be elevated up to 15 times normal because of biliary and liver involvement. CBC: WBC count of 10,000–25,000 is present in 80% of patients. Hb may be lowered because of bleeding. Hct is usually elevated (hemoconcentration associated with vomiting or from effusion of fluid into pancreas or retroperitoneal area). Serum glucose: Transient elevations of more than 200 mg/dL are common, especially during initial/acute attacks. Sustained hyperglycemia reflects widespread cell damage and pancreatic necrosis and is a poor prognostic sign. Partial thromboplastin time (PTT): Prolonged if coagulopathy develops because of liver involvement and fat necrosis. Urinalysis: Glucose, myoglobin, blood, and protein may be present. Urine amylase: Can increase dramatically within 2–3 days after onset of attack. Stool: Increased fat content (steatorrhea) indicative of insufficient digestion of fats and protein. Management of pancreatitis is directed towards relieving symptoms and preventing or treating complications. Pain management. Adequate administration of analgesia (morphine, fentanyl, or hydromorphone) is essential during the course of pancreatitis to provide sufficient relief and to minimize restlessness, which may stimulate pancreatic secretion further. Intensive care. Correction of fluid and blood loss and low albumin levels is necessary to maintain fluid volume and prevent renal failure. Respiratory care. Aggressive respiratory care is indicated because of the high risk elevation of the diaphragm, pulmonary infiltrates and effusion, and atelectasis. Biliary drainage. Placement of biliary drains (for external drainage) and stents (indwelling tubes) in the pancreatic duct through endoscopy has been performed to reestablish drainage of the pancreas. Side-to-side pancreaticojejunostomy (ductal drainage). Indicated when dilation of pancreatic ducts is associated with septa and calculi. This is the most successful procedure with success rates ranging from 60% to 90%. Caudal pancreaticojejunostomy (ductal drainage). Indicated for uncommon causes of proximal pancreatic ductal stenosis not involving the ampulla. Pancreaticoduodenal (right-sided) resection (ablative) (with preservation of the pylorus) (Whipple procedure). Indicated when major changes are confined to the head of the pancreas. Preservation of the pylorus avoids usual sequelae of gastric resection. Pancreatic surgery. A patient who undergoes pancreatic surgery may have multiple drains in place postoperatively, as well as a surgical incision that is left open for irrigation and repacking every 2 to 3 days to remove necrotic debris. The patient who is admitted to the hospital with a diagnosis of pancreatitis is acutely ill and needs expert nursing care. Assessment of current nutritional status and increased metabolic requirements. Assessment of fluid and electrolyte status. Assessment of sources of fluid and electrolyte loss. Assessment of abdomen for ascites. Acute pain related to edema, distention of the pancreas, and peritoneal irritation. Imbalanced nutrition: less than body requirements related to inadequate dietary intake, impaired pancreatic secretions, and increased nutritional needs. Ineffective breathing pattern related to splinting from severe pain, pulmonary infiltrates, pleural effusion, and atelectasis. Improvement in fluid and electrolyte status. 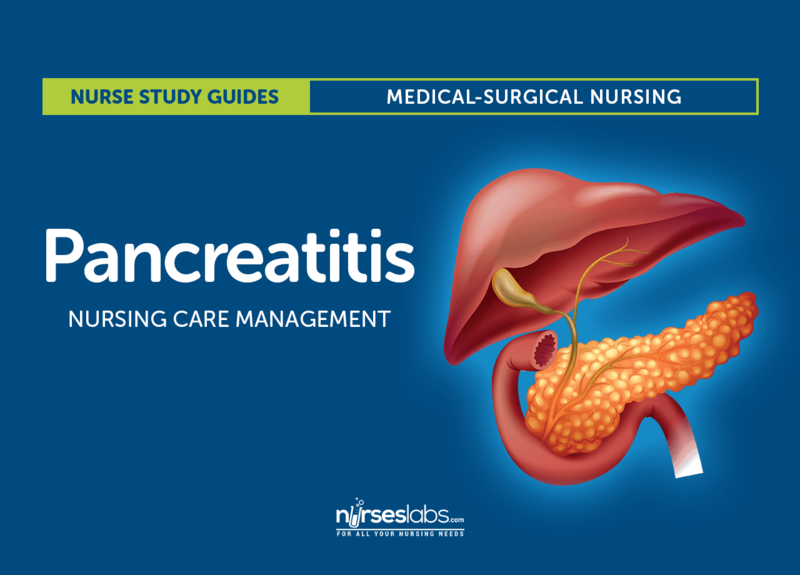 Performing nursing interventions for a patient with pancreatitis needs expertise and efficiency. Relieve pain and discomfort. The current recommendation for pain management in this population is parenteral opioids including morphine, hydromorphone, or fentanyl via patient-controlled analgesia or bolus. Improve breathing pattern. The nurse maintains the patient in a semi-Fowler’s position and encourages frequent position changes. Improve nutritional status. The patient receives a diet high in carbohydrates and low in fats and proteins between acute attacks. Maintain skin integrity. The nurse carries out wound care as prescribed and takes precautions to protect intact skin from contact with drainage. Improved fluid and electrolyte status. A prolonged period is needed to regain the strength of a patient who has experienced pancreatitis and to return to the previous level of activity. Teaching. Teaching needs to be repeated and reinforced because the patient may have difficulty in recalling many of the explanations and instructions given. Prevention. The nurse instructs the patient about the factors implicated in the onset of pancreatitis and about the need to avoid high-fat foods, heavy meals, and alcohol. Identification of complications. The nurse should give verbal and written instructions about the signs and symptoms of pancreatitis and possible complications that should be reported promptly to the physician. Home care. The nurse would be able to assess the patient’s physical and psychological status and adherence to the therapeutic regimen. Respiratory pattern, breath sounds, and use of accessory muscles. A: Pancreatitis is most often characterized by edema and inflammation of the pancreas. B: Pleural effusion occurs in some patient with pancreatitis yet not too often. C: Sepsis is one of the complications of pancreatitis. D: DIC may occur in patients with pancreatitis yet is uncommon. A: Abdominal pain is the major symptom of pancreatitis that causes the patient to seek medical care and this result from irritation and edema of the inflamed pancreas. B: Fever is one of the symptoms of pancreatitis. C: Jaundice is one of the symptoms of pancreatitis. D: Mental agitation is one of the symptoms of pancreatitis. B: Serum lipase is elevated within 24 hours of the onset of the symptoms and remains elevated for a longer period than serum amylase. A: Serum calcium may be taken to detect hypocalcemia. C: Serum bilirubin may also be taken to detect elevation in bilirubin levels. D: Serum amylase is not as prolonged as serum lipase. Encouraging bed rest to decrease metabolic rate. Teaching the patient about the correlation between alcohol intake and pain. Withholding oral feedings to limit the release of secretin. D: All of the interventions mentioned are appropriate for a patient with pancreatitis. A: The patient is maintained on bed rest to decrease metabolic rate and reduce the secretion of pancreatic and gastric enzymes. B: Alcohol is one of the causes of pain in pancreatitis. C: Oral feedings are withheld to decrease secretion of secretin. Which of the following diagnostic studies could identify an increase in the diameter of the pancreas? C: Ultrasound is used to identify an increase in the diameter of the pancreas. A: X-ray may be taken yet it does not identify an increase in the diameter of the pancreas. B: Hemoglobin and hematocrit levels may be taken yet it does not identify an increase in the diameter of the pancreas. D: Serum amylase may be taken yet it does not identify an increase in the diameter of the pancreas. A. Encouraging bed rest to decrease metabolic rate. B. Teaching the patient about the correlation between alcohol intake and pain. C. Withholding oral feedings to limit the release of secretin. 5. Which of the following diagnostic studies could identify an increase in the diameter of the pancreas? B. Hemoglobin and hematocrit levels. 1. Answer: A. Edema and inflammation. A: Pancreatitis is most often characterized by edema and inflammation of the pancreas. B: Pleural effusion occurs in some patient with pancreatitis yet not too often. C: Sepsis is one of the complications of pancreatitis. D: DIC may occur in patients with pancreatitis yet is uncommon. 2. Answer: A. Severe abdominal pain. A: Abdominal pain is the major symptom of pancreatitis that causes the patient to seek medical care and this result from irritation and edema of the inflamed pancreas. B: Fever is one of the symptoms of pancreatitis. C: Jaundice is one of the symptoms of pancreatitis. D: Mental agitation is one of the symptoms of pancreatitis. 3. Answer: B. Serum lipase. B: Serum lipase is elevated within 24 hours of the onset of the symptoms and remains elevated for a longer period than serum amylase. A: Serum calcium may be taken to detect hypocalcemia. C: Serum bilirubin may also be taken to detect elevation in bilirubin levels. D: Serum amylase is not as prolonged as serum lipase. 4. Answer: D. All of the above. D: All of the interventions mentioned are appropriate for a patient with pancreatitis. A: The patient is maintained on bed rest to decrease metabolic rate and reduce the secretion of pancreatic and gastric enzymes. B: Alcohol is one of the causes of pain in pancreatitis. C: Oral feedings are withheld to decrease secretion of secretin. C: Ultrasound is used to identify an increase in the diameter of the pancreas. A: X-ray may be taken yet it does not identify an increase in the diameter of the pancreas. B: Hemoglobin and hematocrit levels may be taken yet it does not identify an increase in the diameter of the pancreas. D: Serum amylase may be taken yet it does not identify an increase in the diameter of the pancreas. actually, Serum amylase is the first thing that is elevated within 24 hours of the onset of the symptoms. At least that’s what our book states.